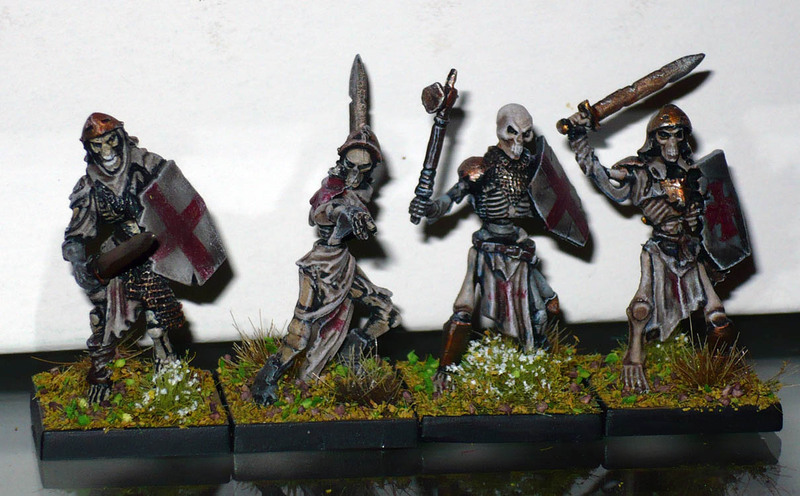 Continuing along the path of least resistance, I did a unit of old metal Citadel Ghouls that I had lying about. 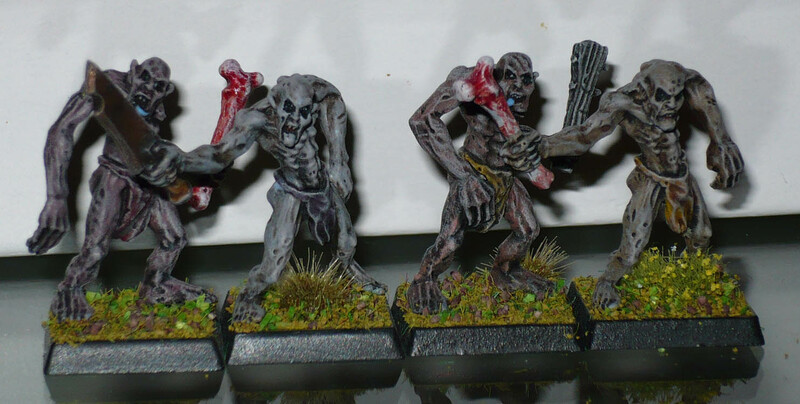 Minis with mostly skin and well scupted detail are often quick and easy to paint, and even faster in batches. Like these ones. Basically same approach as the zombies and Mantic ghouls. I have 17 of these minis (strange number, will be looking for three more), and they were undercoated black. Three different skin tones, one flesh, one blueish and one purplish. Loincloths and details in random colours. One the basecoats were done, the whole figures got a liberal daubing of Army Painter dark tone ink. This served to shade and unify all the colours, giving them more or less the same intensity and similar tonal values. Also some rust effects After that they were all drybrushed with the same brownish grey, that further unified the colours. The trick is to wipe a lot off the brush. -a lot-. so the drybrushing is rather sublte. Of course the pictures are rather harshly lighted by the blitz which ruins the effect rather a lot. 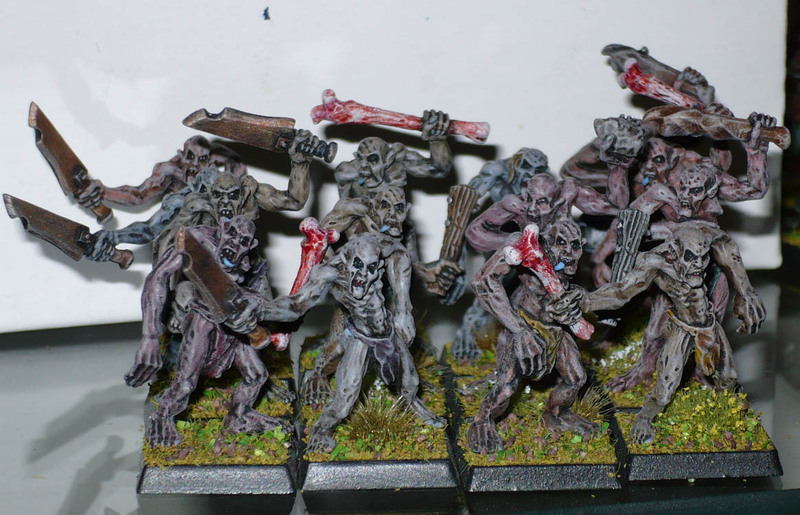 The bone weapons were painted offwhite and not washed with the dark tone ink. Rather, I played around with the new Citadel Technical paint “Blood for the Blood God” Basically a strong, semi translucent glossy red. Which was perhaps too intense, but I think worked for a contrast to the dull greyness of the models, after a bit of drybrushing to bring the tone more in line with the rest. 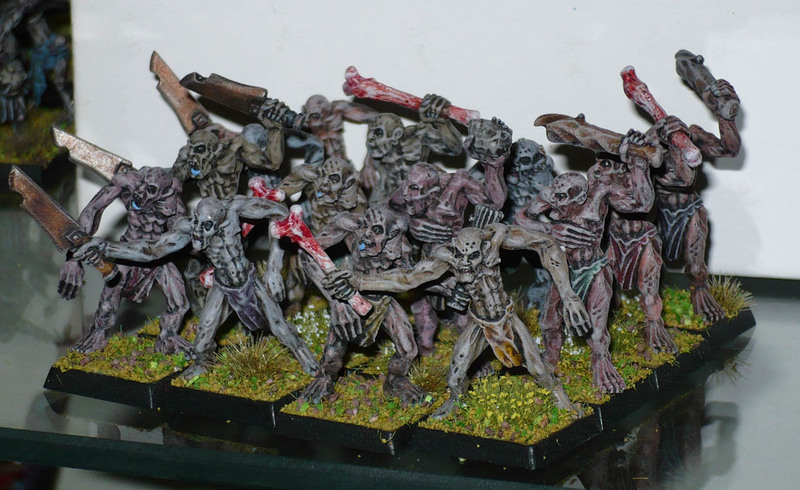 Basically the same as the ghouls, apart from different colours and using Strong Tone Ink instead of Dark tone. These are the first knights of “The Lost Crusade” I am thinking of using as the theme for the army.